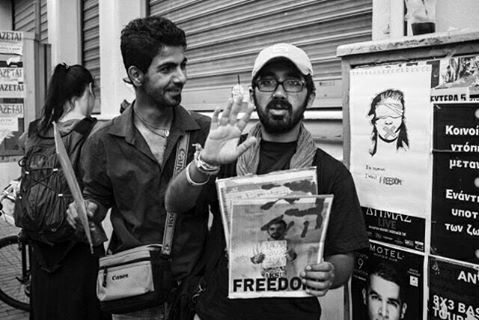 Home / Greece / #MoriaHungerStrike Ended: Outside Arash Hampay Continues! #MoriaHungerStrike Ended: Outside Arash Hampay Continues! After 35 days Bahrooz Arash and Kozhin Hussein ended their hunger strike. But the struggle for their freedom is far from over; Arash Hampay continued his hunger strike. Originally published at Arash Hampay Facebook profile. Statement by Arash Hampay, August 3, 2017. Bahrooz Arash and Kozhin Hussein ended their hunger strike two days ago. We told them that we will continue to stand alongside them, amplify their voices, and do everything in our power to ensure they are released. We understand why they broke the strike after 35 days of being ignored by the authorities, when they were facing imminent death. After 35 days on strike #BahroozArash and #KozhinHussein are extremely weak and urgently need to be released and hospitalized. Their continued detention puts their lives at risk, even if they have broken their strike. The Greek government and the Greek police lacked the humanity and the compassion to be affected by their hunger strike until it was too late. Your death was not going to leave a single mark on their fascistic conscience. Your hunger strike was not going to make the so-called humanitarians in the United Nations care about your suffering. We are really CAPTIVES here and not Refugees. In their treatment of refugees, the UN, the Greek government and the Greek police have torn up and discarded the Universal Declaration of Human Rights and the Refugee Convention in their treatment of refugees. #KozhinHussein and #BahroozArash finally understood that they are not refugees but prisoners. But the story continues. Our solidarity with imprisoned refugees will never disappear. We still demand justice. We still stand against the Greek government and UN. We still demand human rights and the release of falsely imprisoned refugees. It is the 36th day of my hunger strike, and activists, volunteers and dear friends have stood with me from the very first day. As I have said before I am going to continue the strike until Kozhin and Bahrooz, who have been incarcerated without committing any crime, are released. We were not allowed to visit them the last two days and they were not given their cellphones until 11PM last night, when we finally received this information. I, my friends who stand beside me each day Sappho Square in the middle of Mytilini and our dear comrades from all over the world still want to amplify the voices of the suffering refugees until they are released. The Greek government and police, the UN and the EU have to end their inhuman maltreatment of innocent people. They have to end their human rights violations. They have to surrender to the will of the people, submit to the rule of justice, and adhere to the Universal Declaration of Human Rights. States and organisations who claim to represent the people have to submit to the people’s will. I believe and hope that we shall soon reach freedom and victory. Crowdfunding campaign: Support refugees in Greece (IMPORTANT: This campaign is to support refugees in Greece in general and not especially for the hunger strikers. A part of the donations will be used for refugees at Lesvos.). Click at the banner (at the left) to donate. Previous post: #Athens #Greece: Call for Solidarity Gathering for Panagiotis Z. Next post: #Munich Demonstration: #StopDeportations – Abolish the Dublin System! Freedom of Movement For All! After #MoriaHungerStrike: The Struggle Continues! | Enough is Enough! #MoriaHungerStrike: Day 38 Arash Hampay | Enough is Enough!